I love RAIN when it's springtime. It's still WARM outside and it's just CALM. I have been running errands ALL day long. I mailed out all the packages from the winners of various contest. 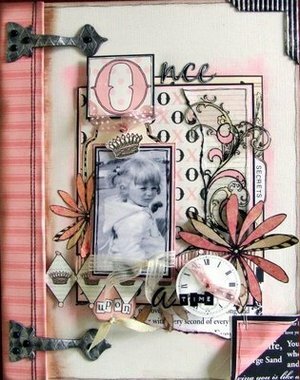 I sponsored a contest at www.scrapscene.com and the winner was Michelle Beck from FRANCE She did a beautiful layout!!!! Then I had to go to UPS to mail a surprise box of goodness to my dear friend Ms. Janna Wilson. Many of you may know her, she and I met through our work at Junkitz. That is just one of my many blessings from working with Junkitz. I love my sweet friend. We talk on the phone as often as we can and we are both TALKATIVE. We are very similar and I simply adore her!!! I am so proud to call her my friend. Love you Janna!!!!! Oh, then the quick trip to Costco that ended up to a quick $200 spent. Can you tell groceries have REALLY went up???? I try to buy healthy food and I think it costs MORE to eat the good food. I loaded up on strawberries and watermelon. I crave chocolate around 7pm EVERY night...always have. So I buy those snack size packs- mixture of chocolate. I then can have a piece at night. The problem is not allowing yourself to eat more than one or two pieces. Ha! I am down 8 lbs. so far. I so appreciate all your emails that helped get me back on track. 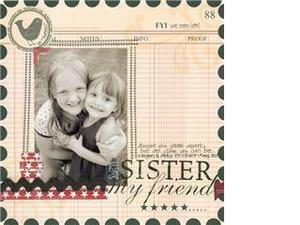 what a cute layout of two sisters. This page is Jen Erickson's layout. I love her creative journaling and the bird/stars. This project is AMAZING... can you see the Tim Holtz grungeboard hinges? on the book??? I was blown away by this book. The talented designer is from the UK- Emma Trout. She used Damask and Bella Girl. I simply am in love with it. I wish I could see it in person. She is on Heidi's (Scrapbook Mate) design team. I have to go make dinner, and then head to church tonight for Young Women's night. I will come home JUST in time to watch American Idol. My girls think I am obsessed with David. HA! I'm just so proud of him. FYI- if you watch the show- you know tonight we find out if he has made the TOP THREE and will get a HOME TOWN visit. So our town- Murray- is already a buzzing. He is performing at our high school football stadium- MHS-this Friday at 4:30 pm. If you are in Utah- it's open to everyone. They are estimating 20,000 people. If he is voted off- well, it's a WELCOME HOME celebration. If he continues on to next week- it's the PARADE too, etc. Either way- it's pretty exciting here. Of course, our family will be there cheering him on. ***please know I support all these finalist. It's just we (well, my girls-) happen to know David and his family. 1. use glossy accents as your adhesive- it will DRY clear. *remember LESS is more. A little goes a long way!!! 2. The rings come in size 7, 8 and 9. They are fairly true to size. I wear a 7, but later in the day or in the summer (hot weather)- I bet I will wear a 8. 3. The rings retail for $1.00 MSRP. Correction: Stamper's Anonymous booth show hours are 10-6pm. Thanks for noticing the new "me"photo. Ty took it for me a couple months ago. I think he is quite the camera man. I think I'll keep him!!! !